The EVOTECH Harness from MSA uses the latest technology in safety and comfort. Designed for day to day use, the harness demands the very most from its users. There are many features of this piece of fall arrest from MSA. This particular MSA EVOTECH Harness comes in a size large. The harness uses breathable padding with a moisture-wicking material, helping to keep wearers cooler and no binding edge on the shoulder padding prevents neck chafing. The EVOTECH’s leg strap design (which is patent-pending) keeps the leg straps in place for increased mobility and padding which offers additional comfort during work positioning. Another feature of this fall protection equipment is the variable width sub-pelvic strap webbing which provides 50% more surface area for improved weight distribution. The harness can be easily adjusted due to the single-hand torso buckle. The convenient 3-position back D-ring allows users to determine optimal lanyard connection position and the built-in RFID chip lets users easily track and inspect the harness. This particular piece of MSA fall arrest equipment features a NanoSphere® coating on webbing repels dirt, grease, moisture, and more. The reflective piping increases visibility in low-light environments and the quick connect buckles and positionable lanyard clip ensure easy wear. 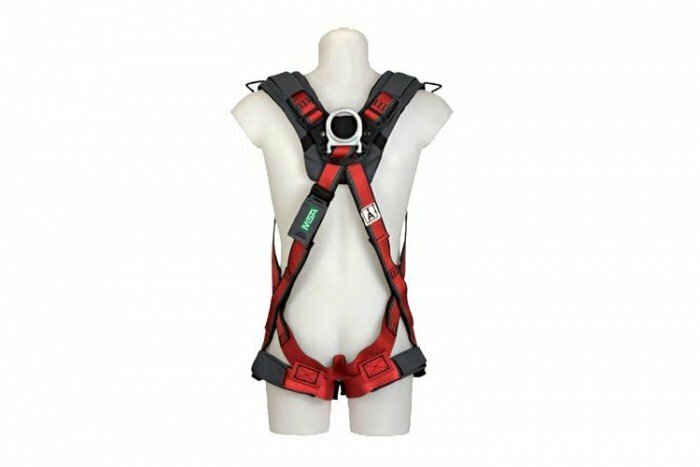 The EVOTECH harness is certified to EN 358 and EN 361 (depending on model).